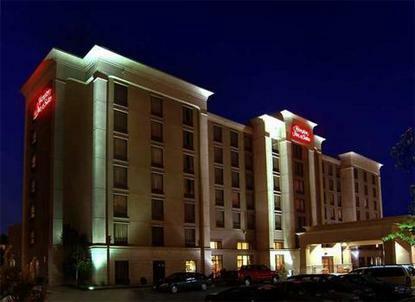 Windsor's newest hotel, the Hampton Inn & Suites has something to offer every type of traveler. We have free local calls, free parking, free toll free access, and best of all a free deluxe breakfast bar you are sure to be satisfied. We offer high-speed Internet service, 2 line speakerphones with data ports, large working areas, and ergonomic chairs for those who are here for business. With our indoor swimming pool, spacious work out facilities, and on demand movies our leisure travelers are sure to be satisfied.Located only minutes from Hwy. 401 and just blocks from the Ambassador Bridge leading to the United States our location is ideal for all. With easy access to E.C. Rowe Expressway which leads you from east to west Windsor, we are only minutes away from your destination.